The University of Delaware Horn Entrepreneurship has announced the winner of the 2018 Siegfried Award for Entrepreneurial Leadership: global entrepreneur, visionary, speaker and author, Dave LaRue. LaRue owns and leads more than a dozen thriving companies, including The Comma Club, a team of entrepreneurs dedicated to creating effortless experiences, vetted opportunities and lifetime connections for themselves and for others. LaRue is a graduate of the University of St. Thomas and the author of Live to Tell Your Story: Stories and Decisions on The Road to Success (2013). He currently resides in Indian Harbour Beach, FL. “The award selection criteria focus on recognizing anyone who has made outstanding contributions to the understanding and practice of entrepreneurial leadership, which might include entrepreneurs, educators or consultants,” said Dan Freeman, founding director of Horn Entrepreneurship. 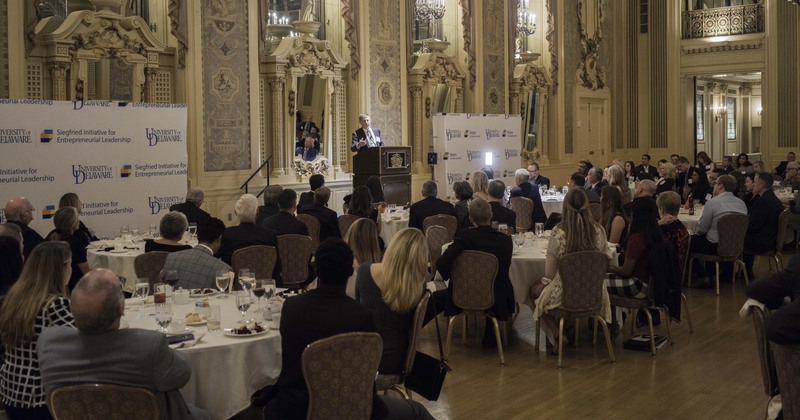 Horn Entrepreneurship’s Siegfried Award in Entrepreneurial Leadership was established by Robert Siegfried, CEO and founder of The Siegfried Group and chair of the advisory board for UD’s Alfred Lerner College of Business and Economics. LaRue was selected to receive the award by a committee consisting of five entrepreneurs and three university professors. Freeman and Siegfried co-chaired the selection committee. LaRue will receive the award, which includes a $10,000 honorarium, during a private celebration on Tuesday, Nov. 20. Siegfried works alongside financial executives on their most important accounting and finance projects. Filled with an innovative spirit and led by an ambitious entrepreneur, Siegfried provides unique Leadership Advisory combined with high potential talent. At the heart of our Firm is our approach to individual leadership and the continual pursuit of helping people grow both personally and professionally. As a whole, we value having fun, being fair and building and sharing stakeholder value.